An earlier conceptual rendering of the park. COLUMBIA STREET WATERFRONT DISTRICT — Despite a recent boost from state funding, the proposed Columbia Waterfront Park is still years away from breaking ground, the group behind the project said. Conversations around the nearly two-acre park along Columbia Street between Kane and Degraw streets have continued since at least 2012 when a conceptual design for the project was revealed. So far though, roughly $1.7 million has been raised and much more is required before a final design can be pinned down, said Milton Puryear, co-founder of the Brooklyn Greenway Initiative, a nonprofit group. The organization is also charged with the creation of the Brooklyn Waterfront Greenway, a 14-mile route for pedestrians and cyclists between Bay Ridge and Greenpoint. This week, Borough President Eric Adams, who earlier allocated $500,000 to the park, announced more than $1.8 million more in funding from the New York City Regional Development Council for projects along the Greenway. That money will support plans for Columbia Waterfront Park, as well as integrated flood protection systems in Red Hook and parts of Sunset Park. But depending on what the green space will ultimately look like, the park is estimated to cost between $3 million and $8 million. "We'll be focused primarily on funding" for the next year or so, Puryear said. "It's not yet clear exactly what the design will be." 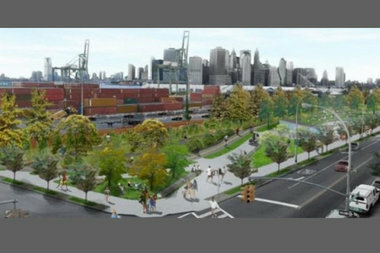 Columbia Waterfront Park is part of BGI's push to create more open areas along the Brooklyn Greenway. One such green space is slated to open next spring at the former Naval Hospital Cemetery. During the early conceptual planning stages, community members voiced a variety of features they'd like to see in the future Columbia Street park, such as a nature-friendly area without too much paving, a dog run and a green space primarily for grown-ups. There was also discussion of turning the the park into a flood barrier system in the event of another storm like Hurricane Sandy. "Once the final design firm is hired ... then these things will be investigated in greater depth," Puryear said. Public community meetings will also be planned during that time. The proposed parkland currently belongs to the Department of Transportation, which Brooklyn Greenway Initiative has been working closely with on its projects, Puryear said. City parks are typically operated by the Parks Department. According to a parks spokeswoman, the agency remains interested in acquiring the land but only if the development receives full funding. The DOT did not respond to request for comment. Last year, the DOT agreed to push back the property fence along Columbia Street by 20 feet so BGI could create a swath of greenery. The DOT also installed benches and bike racks there. "Instead of having a fence right beside the bike path, there's 20 feet of planted area," Puryear said.